Anna-Marie is a versatile and idiosyncratic artist working with a diversity of mediums. She grew up in Kent where she also continues to live and work. 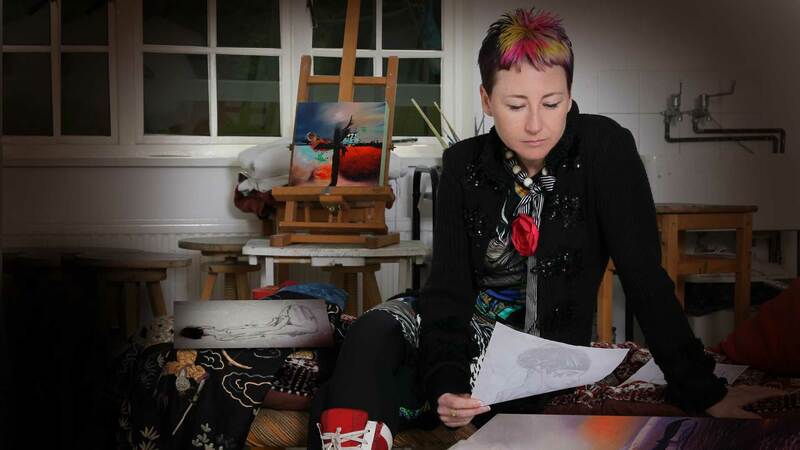 Working as an artist and designer she has created artworks and illustrations for commercial clients and also private collections. After studying art and history of art, Anna-Marie went on to have a career in graphic design, running her own successful, award winning, creative design agency, a company renowned for its quirkiness and originality, an idiosyncrasy that is reflected in her own sense of style, both as an artist and as a person. Anna-Marie’s artistic influences come from studying the work of the Surrealist movement and Pre-Raphaelites. She is emotionally drawn to and transfixed by the dreamlike form and the archetypal content of their paintings, along with the high-realism and symbolism used to conceal a tale. In challenging herself she likes to challenge the viewer by employing an unusual juxtaposition of ideas and images that are well-crafted and drawn, images that are ‘real’ in an otherwise unreal world. Her love of nature gives rise to the need to remain earthed, both in her life and in the themes and ideas that emerge from her work. Art is the ever-changing constant that informs, interprets and delights her life.